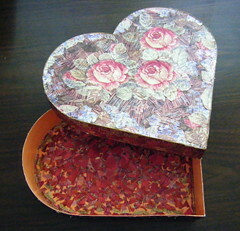 Yesterday I worked for a while on this project, a heart-shaped box that I am covering with collage and decoupage created from printed metallic ribbons. I have been working on the predominantly red interior. I recently decided to add a gold border parallel near the edge. I didn't know how it would look, but it is beginning to take shape, and I think I like it. Right now, rhododendrons are in bloom all over town. It's a wonder to see. 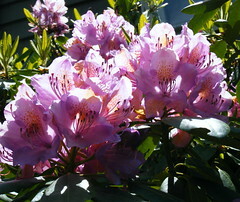 This morning, I went outside to take photos of the rhododendrons near my front door. I like this image the best because of the morning sunlight on the blossoms. A few weeks ago, I came across a great little snapshot in an old album. The picture included my mom, my dad, my grandmother, my aunt, and several family friends, at the dining room table playing poker. (My Uncle Bob was the photographer.) I was raised in a household with an extended family: my grandmother, my parents, my aunt and uncle, and my cousin. (I like to say that I was raised by a committee. People think I am kidding, but it is true.) Well, I found the snapshot of the poker game before Mother's Day, and used that group shot to create a portrait of my mother. (I cropped out my mom's image, changed the background, and then made colorized and posterized versions of the image, posted here on May 8 and 9.) Yesterday I returned to the group snapshot, and captured the image of my aunt. Then I opened the image in Painter, where I used digital pastel to simplify the background, and then colorized and posterized the image. Today I used the result as part of a card to wish my Aunt Edy a happy birthday. She said it would be alright to post this image, so here it is. This is another photograph that I took yesterday at Obear Park here in Beverly, MA. The water was quiet there. 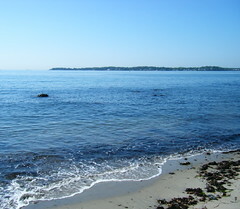 (The park is located in a cove, where the Danvers River runs into the Atlantic Ocean, so the waves are very gentle.) 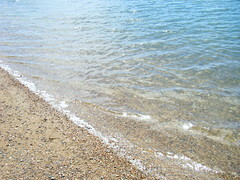 As I walked along the shore, I noticed the translucent light, and the layers of color in the water, so I took a picture. This is a quiet picture, nothing dramatic. But we need to notice, because we can't take beautiful shorelines and clear water for granted. . . . This is a photograph that I took today during a walk at Obear Park, a neighborhood park that is on the water, one of several here in Beverly, MA. Today the beach roses were blooming, and there are lots and lots of them at Obear Park, some pink and some white. 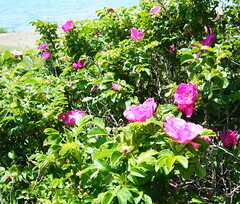 (These are roses that grow near the ocean, and although everyone around here calls them beach roses, they are also called rosa rugosa.) Well, I had to take some pictures, of course. This picture is cropped from one of the photos I liked best. I could have focussed only on the flowers, but I wanted to include a little bit of the sand and the ocean in the image. This is a photograph that I took today during a trip into Boston. 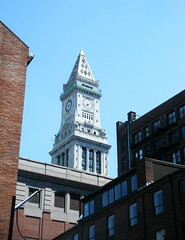 I was near Faneuil Hall and Quincy Market, very close to the Custom House Tower. I love the tower, so of course I tried to take some pictures. I liked this shot because it captures what it looks like to see the tower above the other buildings. Tonight I used iPhoto to crop the original photo to get this composition. This is a photograph that I took during this morning during a walk at Lynch Park, here in Beverly, MA. This little park is surrounded by ocean on three sides. It is almost always about ten degrees cooler at Lynch Park, so it is great for a walk in hot weather. The tide was high, and the colors were great, so I took a few photos. In this one, the land mass in the distance is Salem. I am glad we got in one more walk in at Lynch Park before Memorial Day, when restrictions for dogs go into effect until Labor Day. This is a digital sketch that I drew on my iPad tonight. I wanted to keep going with Brushes, so I started this little drawing, working from my imagination. Then I transferred the image to my desk top, and used iPhoto to crop the image to get this composition. This is digital art, an image that I made tonight on my iPad with the Brushes app. I started with the goal of getting more familiar with the different brushes and textures. I decided to go with familiar imagery, so I used the mountains, working from imagination and memories of the Rocky Mountains of Colorado, where I grew up. I tried out some different brushes, adjusting textures and opacity till I had what I wanted. Then I sent the image to my desktop, and from there, used iPhoto to crop it just a bit. 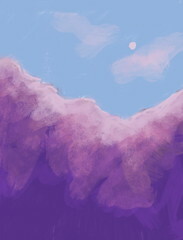 Well, this is certainly not the first mountain I have ever drawn or painted, but it is the first done on my iPad. Last night, I decided to take my iPad along when I went out for coffee at Starbucks. 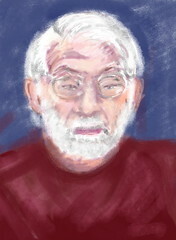 I decided to see if I could use the Brushes application to draw faces, and found a willing model across the table. (He was using his laptop at the time, which meant he was likely to hold still.) I didn't really get likeness, but I learned some more about how to use the Brushes application. Tonight I cropped this image out of a photograph that I took on Mother's Day, during a walk at Long Hill Gardens here in Beverly, MA. 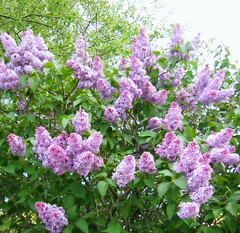 Even though the weather was cool that day, the lilacs were in bloom. I was happy with this photo because all the little blossoms are open, which hardly ever happens when I am trying to photograph lilacs. I also like the dappled light on the flowers and leaves. 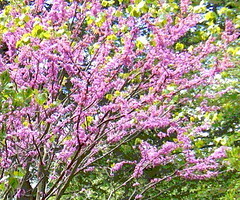 I love redbud trees, and I saw one in bloom during my last trip to Long Hill Gardens. I love the color and the way the tiny buds outline the branches. Tonight I cropped this image out of the original photograph, and then used Painter to posterized the image. Tonight I decided to spend a little more time exploring the Brushes application on my new iPad. One of the options for the brush function makes strokes with little squares, and I have been thinking that it could be used to create a digital mosaic, so I decided to try. Once I figured out how to control the effect, I decided to try a still life. 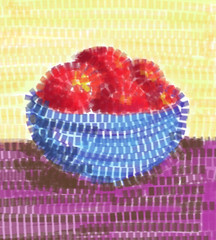 I was working from my imagination, so I drew the bowl first, then drew in some circles for fruit, and decided to go with apples. From there, the fun of drawing the image took over. When I was finished, I tranferred the image into iPhoto and cropped it to get a better composition. This is pencil drawing that I did back in 1979. I was living in Chicago at the time, in Rogers Park, near Loyola University. 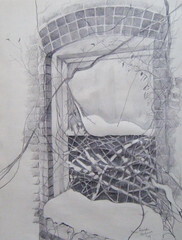 This is a drawing of view through my dining room window, which was the window and brick wall of the neighboring building. (In Rogers Park, most apartments and houses are long, narrow, and so close together that all you can see through a side windows is the brick wall of the building next door.) I did this drawing around the time of one of the major snowstorms that happened during my time in Chicago. I was interested in the patterns of the brick and the tracery of the snow on the vines. Today I came across this drawing while I was looking for something else, of course. I was glad to find it because I had been wondering where it was. So tonight I took it out of the frame and photographed it for safe keeping, and to post here. I am glad I found it, not only because I like the drawing itself, but also because it brings back memories of my adventures in Chicago. This is digital art, a drawing created on my iPad using the Brushes app. 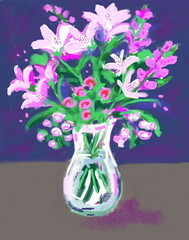 This image began as a drawing from observation, using the bouquet I received last week as my subject.) As the drawing progressed, I became confident that it really is possible to draw from observation in Brushes (which is what I had hoped). Then I relaxed and let my imagination take over, and played with some of the texturesl provided in the application. 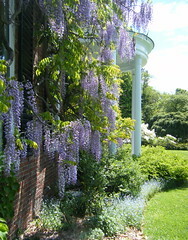 Here is another photograph that I took during last Sunday's walk at Long Hill Gardens here in Beverly, MA. The peonies have opened and they are so big, they look like they belong in a dream. 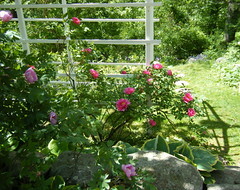 I took this photo because I liked the pink peonies in the dappled light. Tonight I cropped this photo to emphasize the contrast of the flowers with angular patterns of the trellis and its shadow, and the circular stepping stones in the grass. This is a digital sketch drawn on an iPad with the Brushes app. This is my second try using the Brushes program. I worked from my imagination and kept the image simple, so I could concentrate on learning how to use the controls. I discovered the zoom, and wow, that really helped. Here is just one more version of the "Little Digital Flower" pattern! 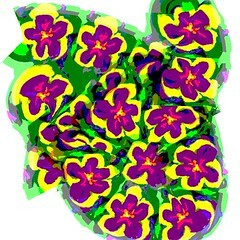 On May 5, I posted a digital image made with Painter's pattern pen loaded with this pattern. 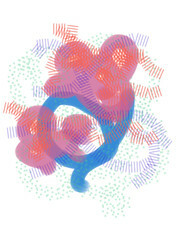 I liked colors and shapes that I produced when I posterized the pattern. But I wasn't at peace with the composition, no matter how I cropped it. I even tried color overlays on the background, but nothing was working. So about a week later (May 12), I decided to make a digital montage, using Painter's tools to copy and paste pieces of the original image into a brand new one. That way, I was able to arrange pieces of the pattern to create a composition that I liked a little better. I have been meaning to post this, and finally got around to it tonight. 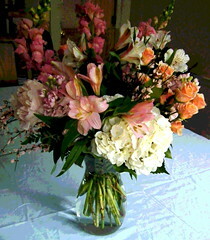 Last Friday, Mother's Day came early when I received a beautiful bouquet. Of course, I had to get out my camera, and then posted a photo of the bouquet on this site. 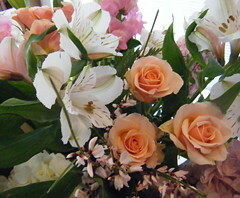 Last Friday, while while I was taking pictures, I also took a close-up view of the arrangement. Tonight I edited it in iPhoto and cropped it to get this composition. This is digital art made with my brand new iPad, made with the Brushes application that I downloaded tonight. Getting used to new technology and new gadgets is not easy for me, but the Brushes application seems very natural and easy to use. I uploaded directly to Flickr and then posted it to my blog. I think I am going to love this! This is part two of my Mother's Day project. Yesterday I posted an image of my mother, a digitally edited picture of her that I pulled out of small snapshot, a group photograph of a poker game. (I also love the original snapshot, probably taken by my Uncle Bob, because among the other poker players are my dad, my Aunt Edy, and my Grandma Kates.) To turn the group photo into an individual portrait, I had to draw over the image with digital pastel, and then posterize it. In yesterday's version, the posterizing was very subtle, to keep the image realistic. But while I was working on it, I tried posterizing at different levels, and in doing so, came up with the second version which appears here. (Posterizing at high levels is creates some distortion, so for this version, I also had to refine the result by with more digital pastel and color overlay.) So no actual silkscreen was involved in creating this image, but I call it a "digital silkscreen" because it reminds me of some of the silkscreens made by Andy Warhol. Well, my mom wasn't an iconic beauty, like Marilyn Monroe, or elegant, like Jackie Kennedy, and she wasn't famous at all, not even for fifteen minutes. But as a little girl, I saw her as beautiful, elegant, even glamorous, and looking at this image I can still see why I thought so. 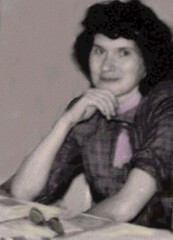 My mother wasn't shy about most things, but she was shy about being photographed. So I don't have as many pictures of her as I would like. Today while looking in an old album, I found a nice picture of her in a small snapshot. This was a group photo, taken at one of the poker parties my folks often had at our house. Other people in the original snapshot include my Grandma Kates, my Dad, and my Aunt Edy, as well as several other of their poker-playing friends. I am guessing that the photographer was my Uncle Bob, because he would have been there too, but he wasn't in the photo. 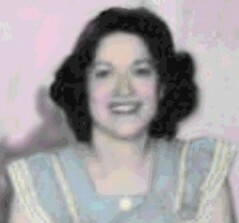 Well, I really like the original snapshot and plan to use it again, but today I was looking for an image of my mom for Mother's Day. So I scanned the snapshot into the computer, opened the image in Painter, and got to work. I cropped out a format that focussed only on my mother. Then I used opaque digital pastel to draw over the image to create a plain background, transforming a group shot into a portrait of just one person. I used a little cut and paste to recreate the plaid dress. Then I used some overlays and digital pastel to add some color, and then I gently posterized the image. This little rescued and digitally altered photograph gives me one more picture of my mom, and this image really does get her facial expression and body language. (And it has made me smile today to remember those poker games in the dining room. A poker-playing mom isn't exactly a typical subject for Mother's Day, I guess. My mother was terrific, but she was anything but typical!) Well, as happy as I am with this image, this is not the best part. While I was experimenting with posterizing this image, I also came up with another version of this image that I like even better. It is less realistic and more modern. I bet my mom would have liked it better, too! But I am saving that version for tomorrow, for Mother's Day. To be continued. . . . This amazing bouquet was delivered today, an early gift for Mother's Day. Of course, the first thing I did was to take pictures of it. I decided to try a little editing on this photo, just to clean up some of the clutter in the background, and then decided to posterize it. I liked the effect, so here it is. 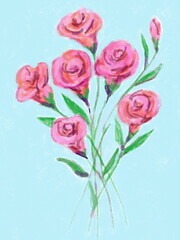 Here is another digital image that I made yesterday while I was showing my friend what Painter software can do. I wanted to show her how the pattern pen works. 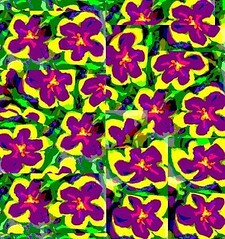 I used a pattern made from my digital sketch called "Little Digital Flower" posted here on March 27, and the pattern on March 31. 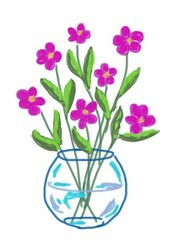 (I drew the sketch on my son's iPod Touch with a program he was trying out, called "My Paint Free"). I used the pattern pen with a transparent edge, made a few strokes, and then posterized. I liked the result enough to save the image. I am still toying with cropping more or changing the background color, but meanwhile it makes me smile, just as it is. 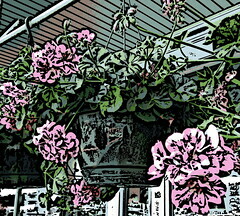 Last weekend, I took a couple of photos of geraniums on display outside the grocery store. I hadn't done much to the original image, apart from getting rid of the price tag on the planter (using iPhoto's retouch tool). This morning I chose the photo to use for a little demo of Painter software for a friend. When I used this photo to create a digital woodcut, I really liked the result, so I decided to keep it. 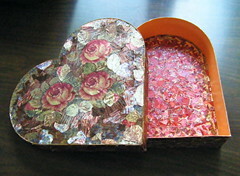 Later, I did a little straightening and cropping in iPhoto, and this is the final product. 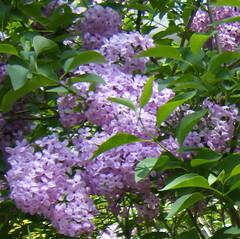 Tonight I cropped this image out of the photo of a lilac bush that I posted here yesterday. Then I opened the image in Painter and posterized it. Then I cropped a second time to get even closer. 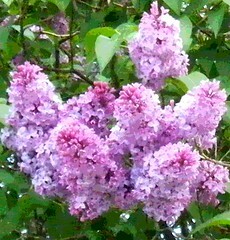 Lilacs look beautiful from a distance, but I always want to get in close and experience the fragrance of the lilacs. This is from a photograph that I took today during an after dinner walk. I saw some lilacs coming into bloom, so I took a picture. Their fragrance is amazing! When I got home, I cropped the original photograph to get this image. This image began during last week's visit to Boston's Public Gardens. It was chilly that day, but I thought my Brazilian visitors would like to see the spring flowers, so we walked down Newbury Street all the way to the park. It was almost 7 PM by the time we got to the Public Gardens, but there was still enough light to see the beautiful colors, and to take pictures. Tonight I edited the original photo to get this image, adjusting the shadows and cropping. You can't capture everything in a photo (and it is usually a mistake to try). 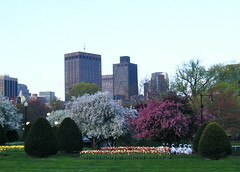 But at least this photo shows the contrast of Boston's skyline and the flowering trees. You can see the rows of tulips, a glimpse of the swan boats on the lagoon, and a bit of the State House dome. 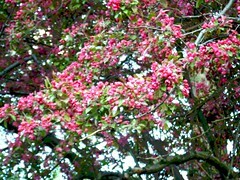 Day before yesterday, I posted my photo of a flowering crabapple tree, taken last week in Boston's Public Gardens, where I took my visitors from Brazil so they could see all the spring flowers. I have been thinking that this photo would be a good candidate for posterizing because it already has a soft focus and diffuse light. So tonight, I opened the image in Painter and gave it a try. I was happy with the outcome, so here it is.